Marong is a rural township on the Calder Highway, 13 km west of Bendigo. It was also the administrative centre of Marong shire and rural city from 1908 until 1994. It is thought that the name was derived from an Aboriginal word meaning a native or Murray pine tree. Although set in the gold fields region, Marong was not a gold town. Being situated on Bullocks Creek, it became a gold-washing place and Commissioners’ camp in 1852. A school was opened in 1859. Gold discoveries occurred in the vicinity of Marong in 1853, but the significant discovery was Wilsons Reef in 1867 about 4 km eastwards. 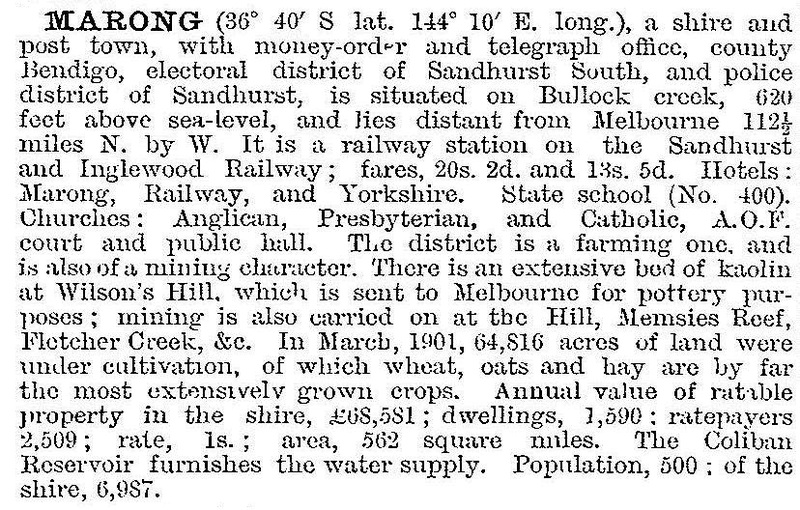 In 1876 the Marong railway station was opened on the line from Bendigo to Inglewood. Mining and cereal growing were the district’s main activities and there were about 60 ha of vineyards. There were Presbyterian (1864), Anglican (1876) and Catholic (1876) churches. Marong’s position on the railway line and the highway preserved it from decline, whereas some former gold mining villages are marked by ruins. In 1908 the Marong shire’s offices were transferred from Lockwood to Marong. Marong’s highway location and proximity to Bendigo have contributed some residential growth to the township. There are three churches, bowls, football and golf clubs, a large recreation reserve, a hotel, a general store and a school (53 pupils, 2010, 94 pupils, 2014). A caravan park is on the highway. At short distances from the town there are several training tracks. Long running plans were proposed in 2003 to develop an industrial estate called the Marong Business Park centred on 300 hectares of farmland along the Calder Highway at Marong.